What is there left to say about Iron Maiden that’s not already been said? It’s been five long years since their last studio album, The Final Frontier. An album I always had a sneaky feeling that was better than it had a right to be. Stunning record. Love it! 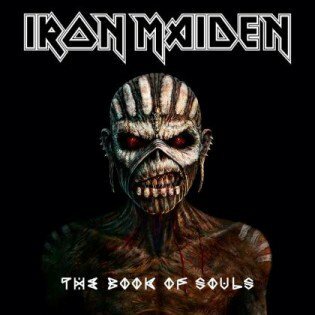 Could Iron Maiden surpass its class and brilliance with The Book of Souls? The Book of Souls is Maiden’s 16th album in their four decade history and is their first double album. Double albums tend to send chills down people’s spines. Can they really sustain the anticipated quality of new music over some ninety plus minutes? That was it for me – my soul was long gone and I was listening! I could wax lyrical about each and every one of the eleven tracks but I’ll resist. The Red And The Black is perhaps my current favourite track out of the eleven on offer. It’s of epic proportions at just shy of fourteen minutes in length but not the longest track on the record. It is the only solo Steve Harris composition on The Book of Souls. Instantly the listener’s head is nodding to the powerful and catchy riff. The “Woah” chorus alone would be enough to make this the latest in a long line history of crowd pleasing anthems. I cannot wait to hear this played live! There’s an air poignancy to Tears Of A Clown, Iron Maiden’s own tribute to the late great Robin Williams. “He had longer to run or so the story goes. Life full of fun. Where did it go?” A fitting tribute to his genius. Empire Of The Clouds brings The Book of Souls to an epic conclusion. Like album opener If Eternity Should Fail, this eighteen minute heavy metal opera is written solely by Bruce Dickinson and, in true Bruce fashion, is linked back to his love of aircraft. Empire Of The Clouds tells the tragic tale of the loss of the R101 airship in October 1930, The crash caused the deaths of forty eight souls and effectively ended British airship development. There is a certain majesty to this epic song. Bruce’s delicate piano intro and accompanying strings add an air of nostalgia to proceedings. “To ride the storm they climbed aboard their silver ghost.” The steady snare drum begins to draw the listener in and you are soon consumed by this majestic metal masterpiece. Stunning! Have a listen if you don’t believe me but be prepared to lose your soul to Eddie forever. This entry was posted in Uncategorized and tagged #blog, #heavymetal, #IronMaiden, #music, #musicreview, #rockmusic, Iron Maiden, The Book Of Souls. Bookmark the permalink.